“Buy Low, Sell High” is the most simple and most fundamental rule of trading. 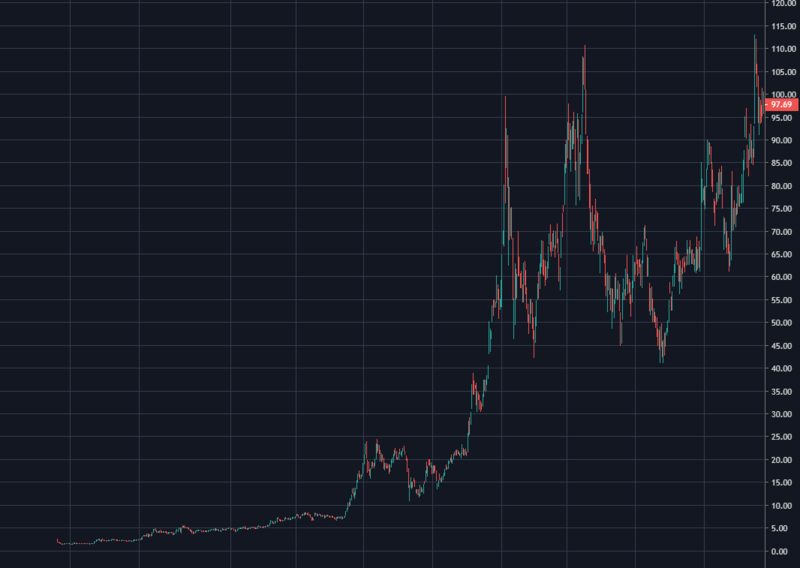 It’s amazing how much FOMO and FUD can affect that simple rule, too often people do the exact opposite: chasing the train after it’s left the station or panic selling a price drop near the bottom. 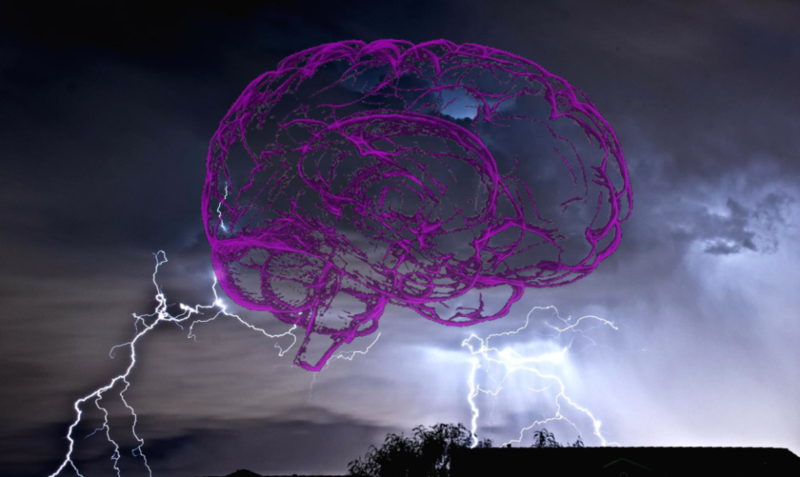 But I’m not here to speak about trader psychology today, I’m here to speak to you about another not-quite-as-simple trading strategy: Buying High. The key is in not selling. And in what you buy. By “not selling” I don’t mean “never sell” – which would be rather pointless unless your sole objective is to leave a large stack of something-or-other to your heirs after you pass. By “not selling” I really mean “hodl long-term”. Seeing a chart like that I would not want to buy, I would be expecting a drop. As you can see, that is the history of the stock price of Amazon. At this stage we need to pause and take stock (no pun intended) before we can continue, we need to discuss this example a little more. Yes you would have earned more had you bought Amazon after its initial fall. But go back to the first chart. Would you have been certain at that stage that it would fall? What would your entry target have been, the $6 that the stock dropped to? I doubt it! Probably more like $80. Would it not have been safer to just grab the next medium-sized price drop and buy then? The fact that Amazon fell so far was due to the implosion of the dotcom bubble. 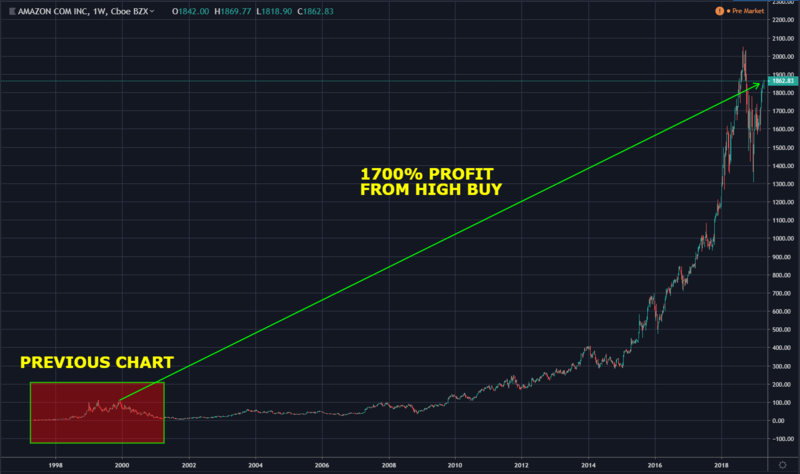 While it is often still cited how many people lost money when that happened, what is less seldom discussed is how the hodlers of good stocks from that time have since profited, as can clearly be seen on the charts. This stock was only good to hold because Amazon was a company linked to a rapidly expanding technology (the internet, specifically: the internet retail market). It is for this very reason that people who bought Bitcoin at $20000 have not lost out if they just continue to hold. I am absolutely certain that $20000 BTC will be seen as a bargain in the not-too-distant future. Buying high and holding is a great idea in crypto because crypto is inherently linked to blockchain technology, a very promising technology which is still in its infancy. Yes I am fully aware that private blockchains are becoming popular within companies, but they will not be an integral part of this revolution. The reasons for this are numerous and too detailed to discuss here. Perhaps I should write an article on that topic. Cryptocurrencies will grow. Exponentially. But’s that’s still not what I really want to say today. So far I’ve basically said: “buy crypto because it will greatly increase in price over time” – true, but not the core topic. You’ve just seen that buying high can make money, but that’s certainly not always the case. Even though cryptocurrencies are a growing asset class, many of them will fail and will lose you money. I always say that the performance of altcoins should be measured in their BTC value. If your altcoin performs worse than BTC, then you should have just held BTC because it is less risky and the returns were higher. If you are looking to successfully Buy High in crypto, then you need to be looking for an altcoin which is climbing in BTC value, preferably even during bearish periods. It is well known that alts generally fall faster than BTC during bearish periods, meaning that cryptos which outperform BTC in bear markets are rare. You need something which doesn’t lose too much value vs BTC during the hard times, and which outperforms it by a good margin in the good times. If you can find such a coin, then it will steadily climb in BTC value over time, no matter the market conditions. As long as you continue to hold it and don’t sell the dips, it will be sure to make you money in the long run. For a coin to have this property, there must be a fundamental reason for its success vs BTC. It’s not enough that the charts alone show consistently impressive performance, that could be attributed to temporary hype which is not worthy of a long-term hold. Any such buy is a risky one and requires in-depth levels of research. You must ensure that the fundamental reasons which make you believe that your coins will continue to climb are indeed correct. Coins such as this will benefit not only from the long-term price gain like other cryptos will (or like Amazon did), but also from their own price increase vs BTC. Within an already high performing asset class, they are the superstars. I believe that I have found some of these coins. Possibly the steadiest climber of the all, BNB has several fundamental reasons for continuing its climb for a long while to come. It’s high now, but you can buy it knowing that it will probably go far higher still. I keep picking up a little BNB at any and every opportunity, the ability to dust small portions of leftover coins into BNB is very useful in this regard. I have spoken about BNB many times, if you search my Steem profile for BNB, then you will find those fundamental reasons of which I speak. Not as steady as BNB, but probably with even more untapped potential. If more people understood this wallet, gaming, Ethereum explorer coin then the price of ENJ would be flying! The fact that they don’t (yet) imbues it with price climbing ability far into the future. You can search my profile for Enjin articles too. Relatively new and relatively new to my own portfolio too, Holo has been climbing very well. As a newer coin it’s a bit more risky than the other two because it does not have such a long performance history. 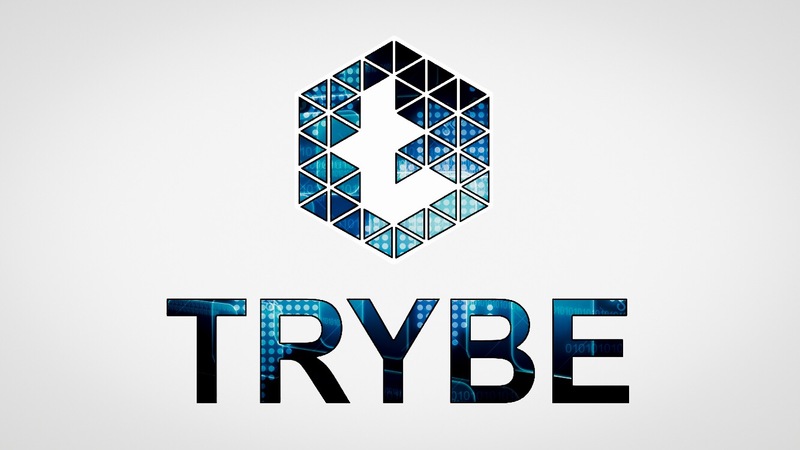 But the non-blockchain technology on which this coin is based is the fundamental reason which should continue to drive its price forward. Note that it has jagged price candles, they are caused by the high token supply which means that even a 1 sat difference in price becomes noticeable. These are the only three coins which really stand out to me as “buy at any price” coins, though it’s not to say that they are the only ones out there. Even my knowledge has it’s limits. When I wrote my very long guide to Holochain I wrote that I was waiting for a price drop before I would buy. Luckily I changed my mind when I realised that Holochain was one of these special examples. I’ve bought Holochain twice this year and I fully intend to buy it again next month, even if the price looks high. KuCoin Shares (KCS) spiked very high in their “Mooning” phase, but then dropped steeply (much like Amazon). Since then they have not done badly, but the coin is still far from ATH. I believe that as the market picks up and grows, so this excellent exchange and its KCS token may well become consistent long-term climbers. Ontology (ONT) NEO’s little brother aimed at companies is showing a lot of promise. Like KuCoin Shares it has not recovered to anywhere near its ATH vs BTC, but adoption could change that rapidly and make it a fierce climber. 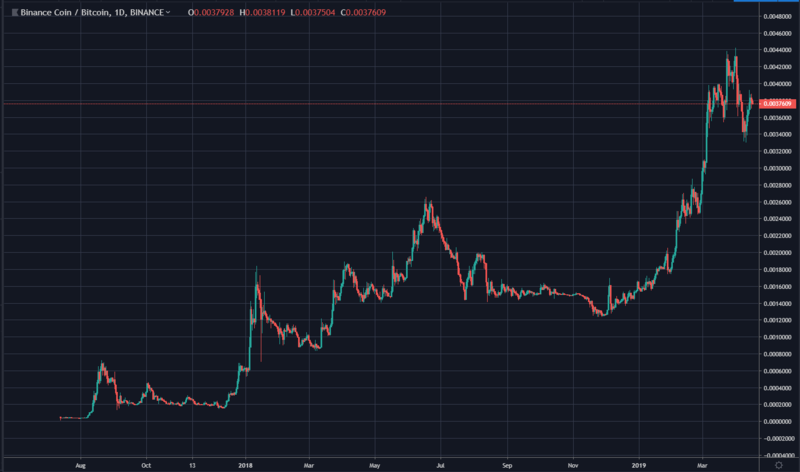 EOS (EOS) is very popular at the moment and is climbing steadily, which is always a good sign. It remains to be seen if the hype is sustainable and if it’s solid back-end can attract enough good projects to keep EOS ahead of most of its rivals. If only the front-end and token economies were simpler, I’m sure it could attract even more interest. Hopefully that will change in the future, whether by EOS itself or by third-party solutions. 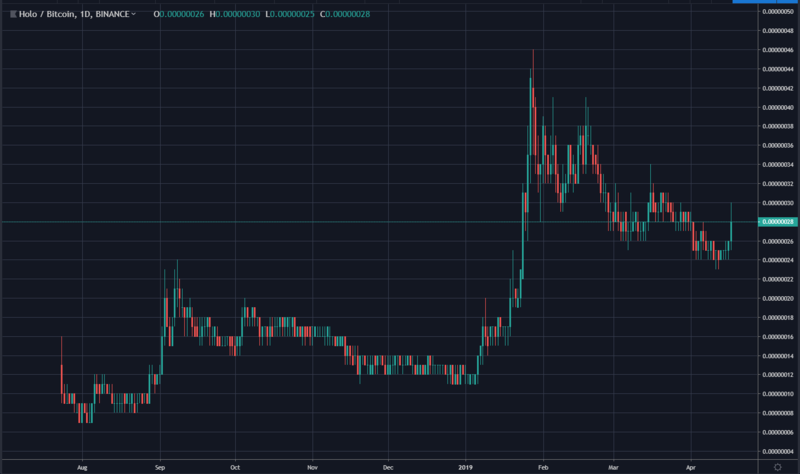 Basic Attention Token (BAT) is at highs only previously seen in the first half of 2017. I honestly can’t say why it is so popular, because I haven’t looked into it in detail in over a year. The charts look solid, so if there is a fundamental reason behind its growth, then it may also be a good buy even at a high price. Tron (TRX). 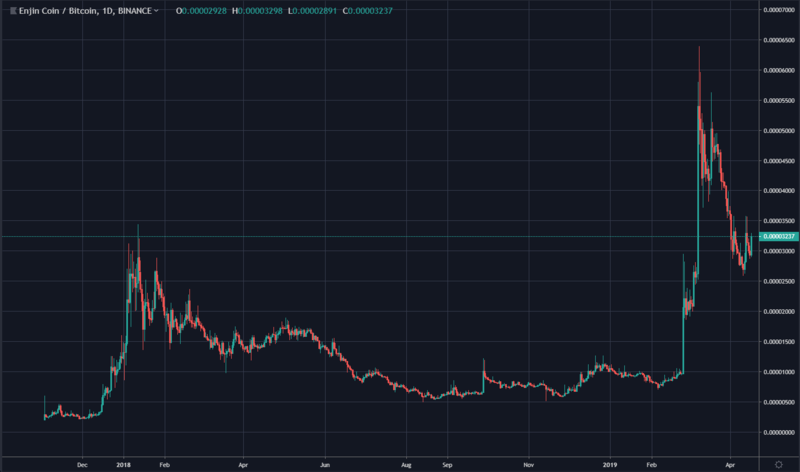 If Tron can avoid breaking through 400 sats on its way down , then there is a good chance that it will start moving towards steadily higher highs, eventually surpassing its previous ATH. Let us see if Justin Sun’s social media presence is powerful enough to make TRX another serial climber! Buying high is not for amateurs. most people who have spent an hour or so on the homepage of their favourite coin would think that they now have some “fundamental reason” to believe that their coin will keep climbing indefinitely. That is not the case. For the more experienced, clued-up and level-headed investors out there, such opportunities do exist: coins which can be bought at any time, no matter how high the ruling price, and which should still turn a tidy profit in the long-term. I strongly caution against buying crypto this way unless you are absolutely 100% confident that you know what you are doing AND that you are fully conversant with the Dunning-Kruger effect and are not suffering from it. I have suggested coins which I think will keep on climbing, but even I make mistakes. For the record, I hold BNB, ENJ and HOT. My HOT and much of my BNB were bought without much consideration for their prices at the time of buying. If I had the money to do so, then I would happily put it into any of those three coins right now. This is not an optimal trading strategy: it does not give the best reward to risk ratio. But it is a viable strategy and should be considered as part of a long-term crypto buy-and-hodl plan to the serious crypto investor. Do you ever buy this way? What do you think of buying high? 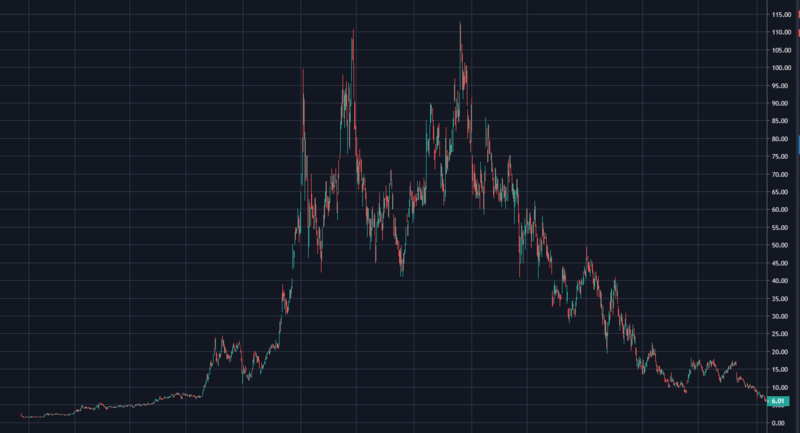 How would you feel if you passed up BNB at current prices, only to see it 100x greater 5 years from now? Let me know in the comments. Steem Price Now Testing the Support Level!